In just a few days, the fam and I will be headed to New Jersey for my cousin Jacqueline Rae’s most anticipated wedding. I love being on the East Coast during the fall. It is certainly my favorite season and one that we don’t get too often here in Los Angeles – unless you choose to drive up to the mountains. The anticipation of boots and sweaters just get me all riled up. It also makes me nostalgic for my younger years while growing up, but especially when I lived in New York City. To me, there is nothing like a crisp fall day in the city – especially on a weekend – and you have all day for brunching and shopping. To this day, I still have a recurring dream that I am in New York – specifically Tribeca – with a day of shopping ahead of me. The feeling that envelopes me is so happy and positive, I am always disappointed when I wake and realize that it was only a dream. I first moved to New York City during the summer of 1989 and, in only a matter of weeks, my first fall cascaded around me like autumnal leaves falling from trees. This was during my Betsey Johnson years so, when my co-worker and good friend Chrissy asked me if I wanted to be her roommate, this opportunity was a dream come true. I had wanted to live in the city ever since I was in high school. I applied and was accepted to Pace University, located near Wall Street; however, I had to change schools at the last minute due to lack of funding. I can barely explain my excitement on moving day. Chrissy was sub-letting a furnished brownstone located on Bethune Street in the West Village (right off 12th Street and a few blocks away from West Side Highway). This is, and was, prime real estate; however, our place left a lot to be desired. The apartment was owned by an older woman who summered in Connecticut. The apartment was huge and took up the entire first floor as well as a basement level. Jennifer Grey, from Dirty Dancing, was our neighbor on one of the upper levels. It even had a decent sized backyard, which is pretty much unheard of in New York. Before I moved in, Chrissy had let me stay over a few times when we had gone out after work. I knew the place was sort of like a mausoleum. It was filled with old antiques and was over flowing with newspapers and magazines. It was cool in an Adam’s Family kind of creepy way. So once I received my invitation to co-habitat, I was in complete denial that the place was a dump. In my youthful naiveté, I was able to ignore certain things that, as an adult, I would not be able to look the other way. The number one concern was that the apartment was infested with mice. I lived in one other flat – more to come about that one later in this post – but in that rodent scenario at least we only actually encountered one. I had the pick of a few bedrooms rooms but the one I selected had a fireplace, cast iron bed, and was walled with bookshelves. It was straight out of an Emily Bronte novel and I was thrilled. I remember that first night clearly. Suddenly, I thought I heard a sound in my room. I thought I must be crazy. So, I snuggled down deeper and heard the sound again. This time is sounded like scurrying and instinctively, it all started to make sense. Sure enough, I turned on the light and caught those rodents red handed. There were about a half dozen mice running around on and around the bookshelves. I was skeeved beyond imagination and barely slept a wink all night. 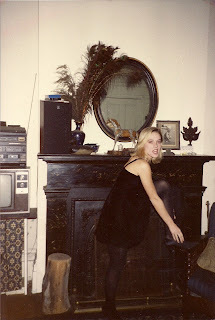 The first time I tried to cook dinner in the 1920s stove that was in the house, more mice than I would like to say ran out of that antiquated appliance like Armageddon. I never did cook at that apartment and ate all my meals at the Greek diner by the 12th Street subway. I’d say that was very Seinfeld. The last and, in comparison, grievance I had was that the water never seemed to go down the drain in the shower…ever. I ended up wearing gardening clogs every time I bathed because as much as I loved Chrissy, I really didn’t want to share her bath water. Yuk! Despite these pitfalls, I absolutely loved that old brownstone and the thrill of living in the city. I loved taking the subway down to the “Village.” I would get off and stop at my diner to eat a Greek salad or Gyro and then walk down my picturesque street complete with flower boxes and geraniums. The outside of our brownstone was beautiful and inviting. I came to know and love the West Village and today, when I head into the city for any significant amount of time, I always try to get down there. It is like an old friend. At the end of October, our sub-lease came to an end. Chrissy and I decided to carry on as roommates and find another apartment. We looked at a lot of places. But, with our budget -- just about $1,000 a month -- we definitely didn’t have a lot of good choices. We knew a couple who were friends and they lived in the East Village. They let us know that a place was available in their building. It didn’t have a doorman, but a reception area with a locked security door and it was in our price range. Can you believe that back in 1990, the going rate for a one bedroom was $1,000. Looking back, I think that was crazy expensive. We showed up and met Thommy Price, the drummer for Joan Jett and the Blackhearts. Thommy and his wife lived in the apartment and were moving on. We met them and hit it off, they liked us and gave us a glowing recommendation, and the rest is history. When we moved into the one bedroom apartment; the place was dingy and depressing. 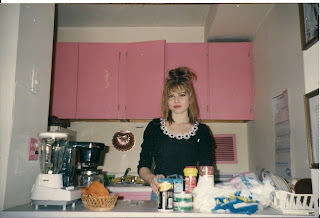 Working for Betsey Johnson, we decided to paint the apartment hot pink and then the place had attitude. Unfortunately, we had to do a few coats of paint where Thommy’s greasy head would lean against the wall by their bed. I mean yuk and super yuk! After a few months of living there, we started to hear noises under our sink. We just could not figure out what it was all about. Was it the building settling, squeaky pipes, or…rats? Apparently, the mother of all rats lived in our building. After our rodent problem on Bethune, Chrissy and I were not tolerant of any more furry creatures with whiskers. We went up to the management company – in person – and said you’ve got to do something about it. They did sent an exterminator and there were no more noises. We lived there for a few years and the neighborhood at the time was less than desirable. Even though today, it is a chichi place to live, we had our fair share of…men chasing us to our building and not out of innocent flirting (more like I have a knife give me all your money); the 24 hour key making kiosk (can you say D*R*U*G*S); and the best for last…when a water main broke on our street and it was closed off for three months, a mysterious rolled up cheap (shag for the sake of creative license) rug showed up in front of our building during the frigid cold winter. With the spring thaw, they found a body rolled up in that rug. Ewwww! Jerry Orbach and Chris Noth from Law & Order showed up to check it out but, sadly, the crime went unsolved. Since I didn’t have insurance, I went home so my mom could take me to the doctor. I had broken my foot clear across and would have to stay off it for a few months. I suppose living off Top Ramen and icing glazed animal cookies -- not to mention cockails, cocktails and more cocktails -- just wasn’t sustaining moi. This was a defining moment for me. 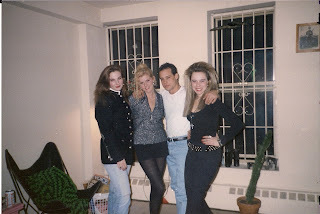 Living in New York City and putting every penny I made – that I didn’t spend shopping and looking fabulous – into rent had gotten the best of me. My mom was concerned and, as a good mom, she should have been. So, on a cool crisp autumn morning, my dad showed up with his truck and – with so much regret – I allowed him to move me out of my Alphabet City apartment. I remember driving home and feeling melancholy. In retrospect, I never really left New York City since it was and will always be a part of me; however, random people always used to say…you seem more like an L.A. girl than a New York girl. Missoni for Target Hits the Streets...For Real! Mission Missoni Accomplished: Right on Target! The Rachel Zoe Project is EVERYTHING!